Alias: Hungry Darkness of 1000 Souls. 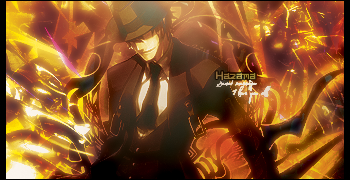 Hazama's appearance is taken after the shady, creepy archetype. He is depicted with bright green hair and an ever-present smile with his eyes closed, belying a demonic nature. He wears a simple black suit with a white shirt underneath, short brown gloves, and brown steel-toed shoes. He dons a pair of black trousers held up by two brown belts. He completes the outfit with a black fedora hat to close the shady visage. When upon anger or ''insanity'', he removes his hat and tie, his hair spikes upward, and he opens his eyes, which are gold with snake-like slits for pupils. His smile also becomes that of a psychopathic killer. 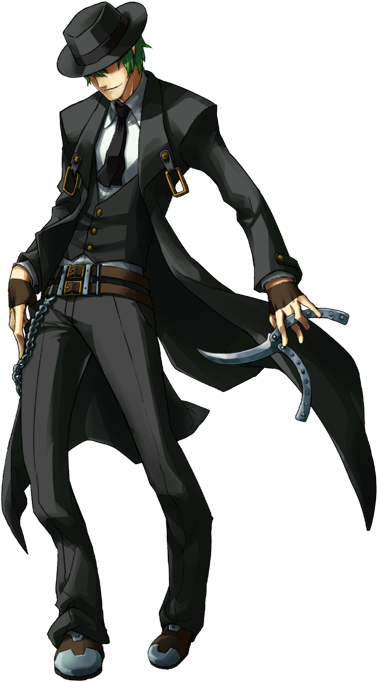 Hazama maintains a calm and quiet demeanor around most people, pretending to be harmless as ''a member of the Intelligence Department''. He claims to hate fighting and prefers to avoid conflict. This, however, is simply a guise to his true nature. When people see through it, he shows his true colors as selfish and manipulative; destroying other people's lives and twisting their beliefs for his own gain. He has no qualms with killing those who get in his way, and doesn't seem to show any kind of remorse for his actions. When he reveals his true self as Yūki Terumi, he becomes quite sadistic and insane in nature, relishing in others' misery and suffering. Terumi takes every opportunity to upset others by mocking them, deliberately provoking them, or even bringing up and prodding at a sensitive topic; all for his own enjoyment. However, he also harbors a cold and ruthless side when someone upsets or irritates him, in which case he starts torturing them excessively. Zanpaktou description: In battle, Hazama wields the Zanpaktou named Geminus Anguium: Ouroboros; a steel hook crafted in the shape of a snake that he summons in front of him, attached to a chain of green/black energy, which he can use to attack opponents from afar, or reel them in, as well as zip around the battlefield quickly, if not instantly, and close gaps between him and his foes. On the other hand, he also uses Balisong-style butterfly knifes for close-range attacks. Shikai description: Hazama's shikai is Ouroboros, utilizing his Nox Nyctores' namesake to soar around the battlefield using his weapon to pull him in, regardless of whether or not Ouroboros has made contact, in order to make up for his lack of long range or projectile attacks. Above his Heat is a counter for his Ouroboros that determines how many times he can pull himself in (2 at max). Though it usually recharges after two seconds, he can get some back by simply hitting the opponent with the weapon and allowing it to click a second after it lands. Bankai description: Having been the original creator of the Azure Grimoire, a bankai, he possesses his own imitation, activating it in an identical manner to mock people. When activated, a large magical circle envelops him, slowly sapping away vitality of anyone who steps inside. Also, a normal human was unable to use his own shikai. 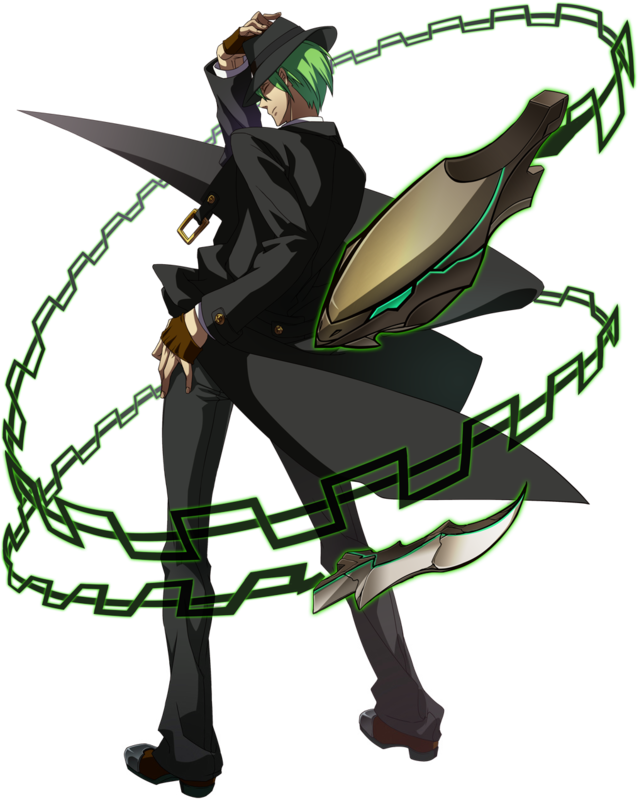 Hazama's true form as Terumi depicts him as a black apparition with green glowing veins and aura, or alternatively, his facial features become psychotic and his hair spikes up. Alright! Since i cant deal with making a long history now, lets make this short! Yūki Terumi was originally a hero, with 5 other ones, who fought against a hollow monster known as ''Black Beast'' in a war. He created something called the Azure Grimoire and had wished to quell the mistake he had made. However after the beast was destroyed, he turned his back on the 5 other Heroes, and murdered one of them, Nine, who was the mother of a fellow heroes' child. After that he suddenly appeared at a church, burned down it and lol'd, and then suddenly cutted down one of the person's arms there, and lol'd more. After that and many years after, he met a woman known as Suzume, Snoop Dogg, etc, etc. The greatest crazy psychopath killer in History! Snoop Dogg wrote: The greatest crazy psychopath killer in History!